Posted November 1st, 2016 by Media Heroes. Brisbane is a fantastic city for cycling. Whether you like a relaxing ride on a Sunday afternoon, or you ride to work every more, Brisbane is sure to have a bike path for you. With frequent use however, it is possible for your bike to sustain damage, or even just daily wear and tear. Gradual deterioration to a certain extent is perfectly normal and it does not mean that your bike is of a low standard of quality. It does mean that you must take care to maintain your bike to a high standard, so that you get the most out of your purchase. Some bikes are slightly more prone to damage than others and this can be worsened by rough terrain, water damage and other such factors. For example, if you ride a vintage style bike to work each day over a poorly maintained path or road, then you might run the risk of gradual damage. This is, of course, because vintage style bikes have no front suspension and therefore experience more strain when ridden on rough surfaces. Fortunately, with some professional care, your bike can remain at showroom quality for many years, regardless of what you ride. To keep your bike on the road or the path, periodic maintenance and repairs are essential and who better to do it than a professional. 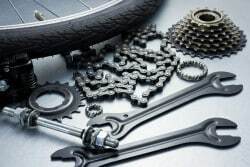 Bicycles are relatively simple when it comes to their working parts, but this does not necessarily mean that bicycle repair and maintenance is an easy undertaking. You need a number of specialised tools, the right knowledge and an eye for spotting any damage or deterioration and this where the experts can be of great assistance to you and your bike. The professional maintenance staff at your local bike shop know exactly what to look for when it comes to finding damage or wear in your bike and they also know how to fix it. Getting your bike serviced is a little bit like getting your car serviced in the sense that it is important even if you haven’t spotted any obvious problems. Certain components of your bike are especially prone to damage and this can occur suddenly and without warning if you don’t take the proper precautions to prevent it. Damage and deterioration in your bike can be subtle. You might not always be able to put your finger on precisely what is making the funny noise, or why something seems to be grinding, but you know it’s there nonetheless. Asking a professional will always get you a solution and listed below are a few things that might be threatening the condition of your bike. Brisbane is prone to sudden rain and most cyclists will get caught out at least once or twice in their cycling career. This can mean more than just getting wet, however. Water can penetrate the working components of your bike with ease and if left unaddressed this moisture can soon become rust. A good preventative measure is to keep all moving parts of your bike well lubricated with water dispersant and ensuring that it is professionally served at least once a year. Tyre pressure is something that is commonly overlooked when it comes to bike maintenance, even though it is quite important. Low-pressure tyres are more prone to deterioration and this can also cause your rims to buckle. Buckled rims can, in turn, cause damage to your brakes, which sometimes require costly repair. Chains are another part of your bicycle that can sustain damage if not cared for properly. Probably the most common form of chain damage is rust, although there are numerous ways to safeguard against this. Most important among these is to keep your chain well lubricated in between professional services. For all your bicycle repair and maintenance needs in Brisbane, get in touch with the experts at Hoffy Cycles today on (07) 3269 1213.